Martin Newman of Plumerai & DRLNG returns with his project Goddakk for five minutes of manipulated & mutilated guitar experiments. Goddakk runs through a gamut of distortion on “Praises to My Devourer”. Full of a joyful sense of destruction the songs manage to convey quite a bit throughout their duration. Close to a full collapse at times the works explore strange universes of noise and sound. An element of rock can be found throughout the gritty industrial atmospheres. By letting these pieces roam free Goddakk works on worlds that teem with activity. These pieces feel almost alive thanks in part to Goddakk’s insistence on exploring messier terrain. “52 Hertz” introduces the borderline coherent world. Full of digital manipulations and assorted noises the piece churns around as if it is simply warming up. Things become far clearer on the weird shuffle of “Where the Truth Lies” as it moves forward with a peculiar rhythm. Within the excess noise a melody rests underneath helping to give the piece structure. On “My Devourer” the world moves away from the harsher noises introducing a beautiful shimmering drone. Digital noise defines the odd grunge of “Southbounded”. By far the highlight of the collection the piece comes together nicely creating the closest approximation to a discernible rhythm and melody. Almost pop-like in nature it glows with optimism. Finishing things off is “Winter in the Garden” whose chiming noise brings the collection to a mindful close. Distorted beyond belief, noisy, and with a clear nod towards early industrial, Goddakk’s “Praises to My Devourer” is aware of the history of its sound while it moves forward into the future. 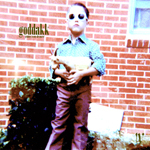 US project GODDAKK is the ongoing solo project of Martin Newman (Plumerai, DRLNG), and have released two full albums and two EPs in addition to some compilation contributions so far. “Praises to My Devourer” is the most recent of the EPs issued under this moniker, and was released by US label Silber Records towards the end of 2014 as a part of their ongoing 5-in-5 conceptual range of EPs, where the concept is to create a 5 minute long EP with a total of 5 compositions. Newman’s approach here have been to create 5 pieces of music each clocking in at around the minute mark. Opening with a dark, eerie and alien soundscape, complete with distant instrument howls, and he continues with an eerie light toned drone over plucked metallic instrument sounds. The third track returns to a more dismal, dystopian darkness, menacing and futuristic, while the fourth cut is a calmer affair with echoing gentle electronic details over twisted and highly distorted plucked guitars. The conclusion comes by way of light toned distorted guitar details combining with dark, eerie yet subtle electronic effects, a soundscape that sounds mechanical and organic at the same time, and then in a fairly unnerving manner. Those fond of drones, electronic effects and twisted instrument details explored within a haunting, dark and at times oppressive framework should find this EP to be well worth investigating. 5 minutes of sounds and music pulled from some of your more sophisticated nightmares. Next up Goddakk which in case you didn’t know – like us as it happens – is the extra curricula handiwork of Plumerai’s Martin Newman here doing all manner of strange things with guitars some we suspect illegal were there a Geneva convention for 6 strings, again 5 tracks as part of the 5 in 5 dare / task / request and very far removed from his usual dream pop comfort zone. Both ‘my devourer’ and ‘southbounded’ appearing wonkily woozed in the kind of minimalist atmospheric play craft that set up Louis and Bebe Barron as leading lights of the electronic sound age, sound wise sounding like party hard chatter between electroid diodes. ‘where the truth lies’ is made of darker stuff, a chilling cold war slab of edgily paranoiac blank generation futurama while ’52 hertz’ is wired up and get busy enacting an autopsy to pull out and reveal the psychotic dark heart of Numan’s coldly abandoned ‘replicas’. The monochromatic ‘winter in the garden’ wraps up matters though not before leaving you slightly unnerved and frozen to the spot with a deep sense of eerie unease and a desire to pill out your prized stash of early echoboy and add n to x releases.